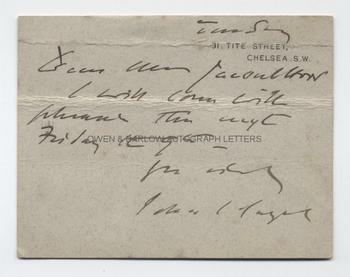 JOHN SINGER SARGENT AUTOGRAPH Letter Signed. American artist who is generally considered to be the most important PORTRAIT painter of his generation. ALS on his correspondence card. 31 Tite Street, Chelsea, S.W. Tuesday [no date]. To [George Percy] Jacomb-Hood. "I will come with pleasure the night Friday the 9th." Approx 4.5 x 3.5 inches. Two horizontal creases. VG. George Percy Jacomb-Hood was a portrait painter known for his urbane sociability and was a founder member of the Chelsea Arts Club. He was John Singer Sargent's neighbour in Tite Street and the two were on very friendly terms, often to be seen riding their horses together.